Tree stumps can be unsightly and may provide a home for termites or other garden pests. Bob & Ben the Tree Men can completely or partially remove stumps using our range of stump grinders. Our hand held grinder, which can be carried up stairs, suits jobs with difficult access, stumps in raised garden beds or next to pools. Our compact machine can fit through doors and still grind large stumps. 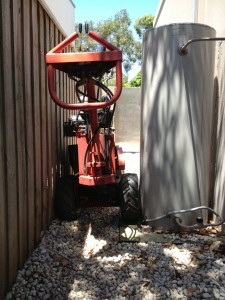 Our compact stump grinder can fit through narrow spaces to grind large stumps. For very large stumps that need deep grinding or complete removal, our 70hp grinder is the most suitable. For example, when preparing a building site for a new construction. Grinding out a stump before excavation can be more cost effective than using an excavator and paying tip fees. Once your stump has been removed to a suitable level, you can replant, turf over the top or excavate for building. A small pile of grinding mulch will remain on the job and can be spread around the garden or left to settle. We can also take it away if requested. Before we commence work, it is important to determine where the services run under your property. You can check this by calling Dial Before You Dig on 11 00.